Epichloë festucae, and many related epichloae (fungal genera Epichloë and Neotyphodium) are bioprotective, seed-transmissible symbionts (endophytes) of grasses in the subfamily Pooideae; the so-called cool-season grasses. They are known for production of various alkaloids, some of which protect against insects, and others that can cause episodes of livestock toxicosis. Strains lacking the anti-vertebrate activities greatly enhance productivity of forage grasses. 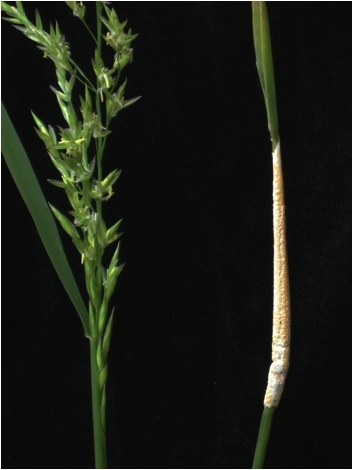 The endophytes inconspicuously but efficiently transmit by colonizing host panicles (left), but some such as E. festucae can also fruit on their hosts (right), making classical genetic analysis possible. 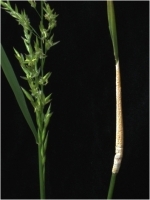 Molecular biological techniques have been useful for studying how E. festucae and it hosts get along so well in nature.